I am going to show very basic configuration which is to be done from iSCSI Target (vSAN ) and iSCSI Initiator ( Windows Machine) . 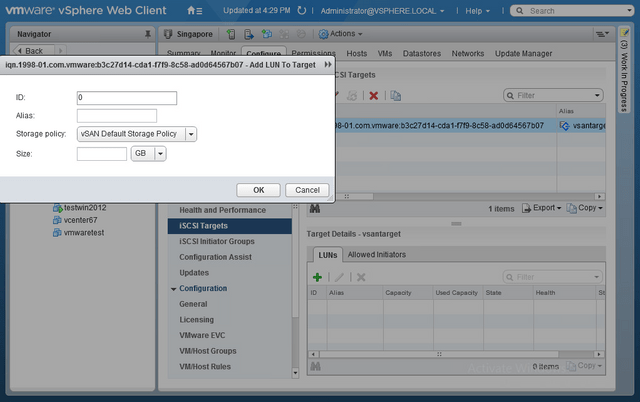 Considering vSAN already enabled on the cluster and configured correctly. Check the checkbox and enable VIT service. 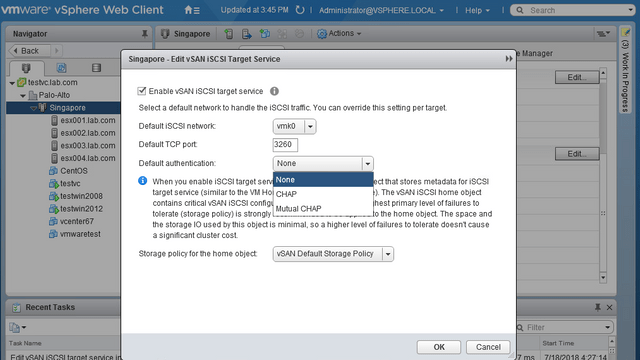 Choose iSCSI network from vmk ports. It can be vSAN, mgmt. or iSCSI vmk ports. By default authentication is none and can be enabled unidirectional & bidirectional based on the requirement. In my case I am choosing None and clicking on OK to finish this task. Now, you will see the VIT service is enabled and showing healthy. 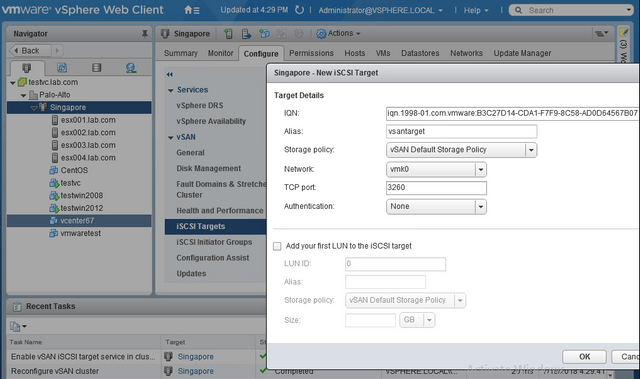 Next task to define iSCSI targets and LUNs. 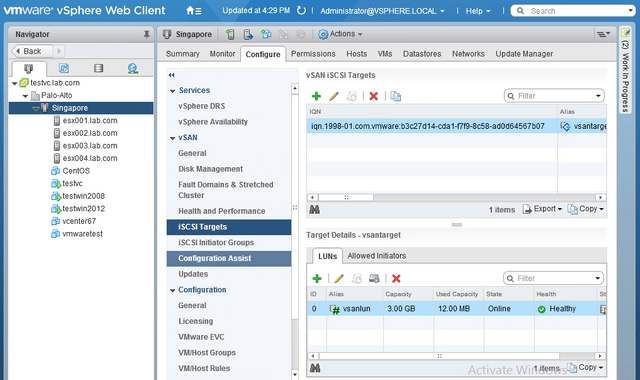 To do the same go to configure ⇒ iSCSI targets . I am choosing the option to add the LUN later to explore other options. 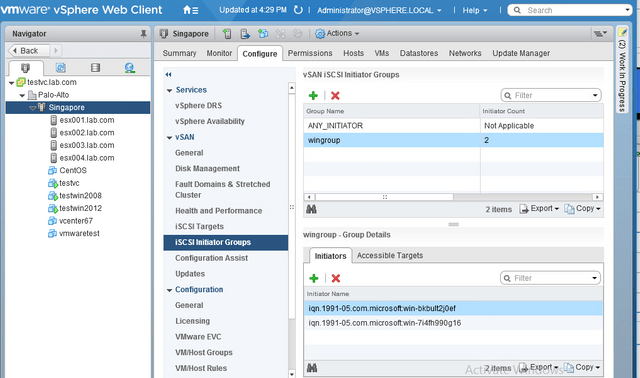 Now, we can see that LUN is added as part of iSCSI Target and showing online plus healthy. Multiple LUNs can be added to the same target by clicking on + in LUNs section. Next step is to create initiator groups and allow initiators. By default, all the initiators are allowed but for security reason we must create initiator groups and allow that group. 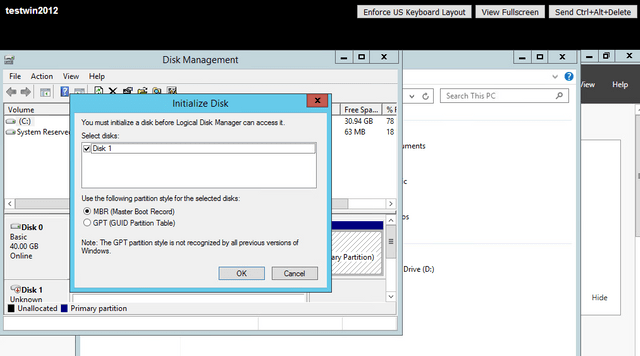 You can find initiators IQN from iSCSI initiator tool in windows machine. Just need to check in configuration tab. Once LUN is mapped to target we can add more LUNs by clicking + sign and edit the size. Once target and LUNs are defined. Next, steps is to create initiator group and add initiators in that group. 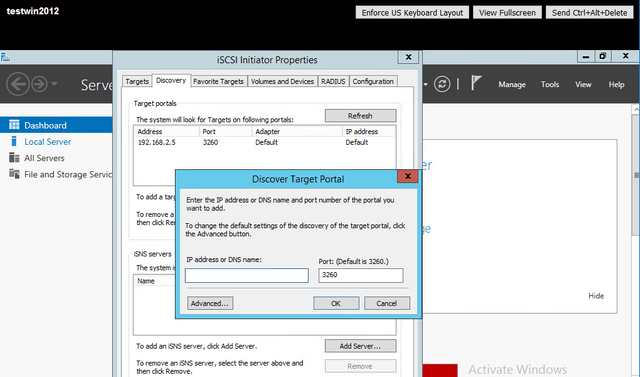 Now, this group can discover the accessible portals ( iSCSI target). By defaut, Any initiator is allowed to access target portal however we can defined our own groups as well. Once initiator groups is created, it is mandatory to allow initiators to access target portal. In the screenshot below, click on accessible targets & add target to authorize the portal discovery. If this steps is ignored, you may face authorization failure error while discovery from initiator. 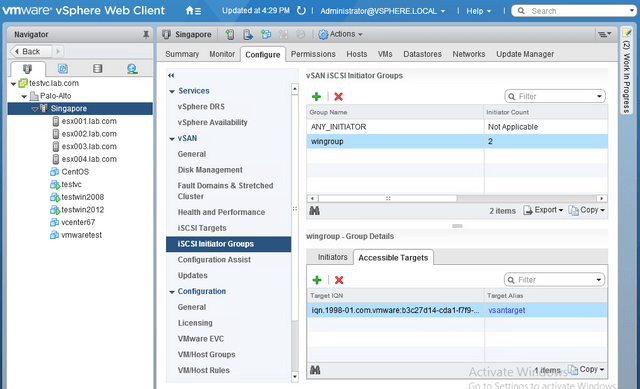 At this stage you may get authorization error if initiators are not allowed to access target portal in webclient. 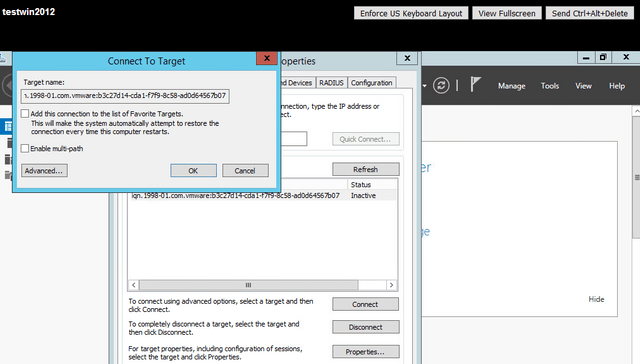 When you click connect, you can save it to favorite targets and enable multipath sessions. In order to configure multipath sessions, you need to check Enable multipath and add another target portal to have different session created. 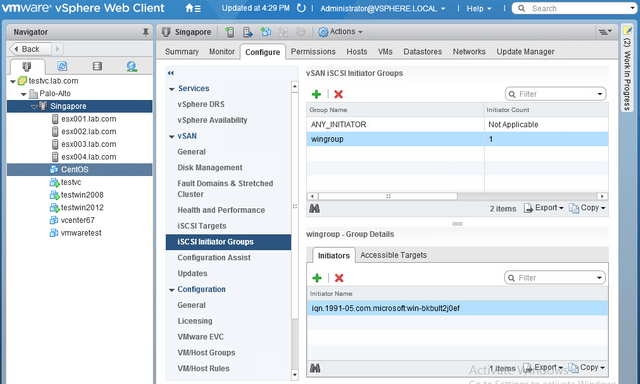 Only one session per connection is supported in VIT configuration. 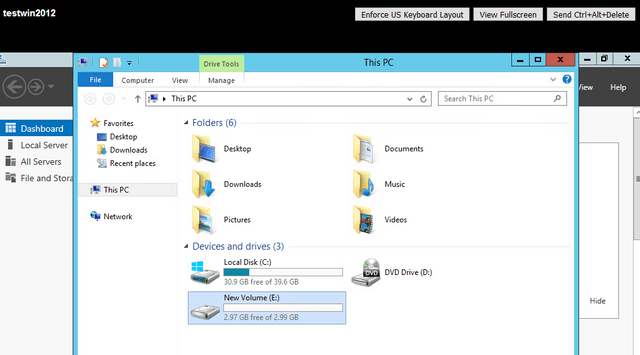 I have formatted the drive with MBR & created simple volume which can now be used.